When it comes to choosing a traditional sofa bed for your living room, it's all about style and comfort. We're well aware that finding a sofa bed that's attractive, comfortable AND fits your budget is a true challenge. Luckily for you, we've put together this handy guide to help you purchase your next traditional sofa bed. These sofa beds won't just ensure guests have a great night sleep, they'll also fit seamlessly with your living room. Need help choosing a sofa bed? Whether it's a contemporary sofa bed, a small sofa bed or you're on the hunt for a budget sofa bed, we've got them all. Sure to add a vintage vibe to any room, the Bulford traditional sofa bed from Willow and Hall doesn’t just look lovely, but it also comes with a 14cm deep mattress so your guests will be sure to get a wonderful night's sleep. It doesn’t get more traditional than a warm brown leather sofa. We love the classic design of this three seater sofa bed from DFS, plus it’s durable, easy to clean and comes in six different shades of leather. Trying to squeeze a sofa bed into a small living room? The Chatnap sofa bed from Loaf is super compact and can be made even more so if you choose to remove the arms. Not only does the Tidworth sofa from Willow and Hall transform into a spacious double bed, it also has a chaise storage compartment. Ideal if you are looking for extra living room storage. Ah... the velvet sofa. They’ve have been on our lust list for what feels like forever. But just because they are so incredibly beautiful doesn’t mean they can’t also be practical – this velvet Pudding sofa from Loaf has an entire double bed stashed beneath its insanely plump looking cushions. Redecorating your living room on a budget? You don’t need to blow all your budget on a sofa bed, this Chou sofa from Made.com comes in under £400 and it even has storage for your spare bedding. Check out all of Made.com's beautiful sofas. Going for the Mid-century modern vibe in your living room? The simple design and tapered legs of the Douglas sofa bed from sofa.com would fit right in. Okay we can all see that this sofa looks great so let’s talk about that mattress. The Zircon sofa bed from DFS comes with a dual layer, super supportive mattress consisting of a polyether foam base with a memory foam top layer. Being relegated to the sofa doesn’t sound so bad now, right? Yep, that’s a thing. And it’s going to raise your hosting game. Last-minute sleepover? Oh wait, let me just pull a bed out of this box you thought was an ottoman. The lid of this Made.com Ilma ottoman is fully upholstered with button detailing that would perfectly fit into a traditional living room. 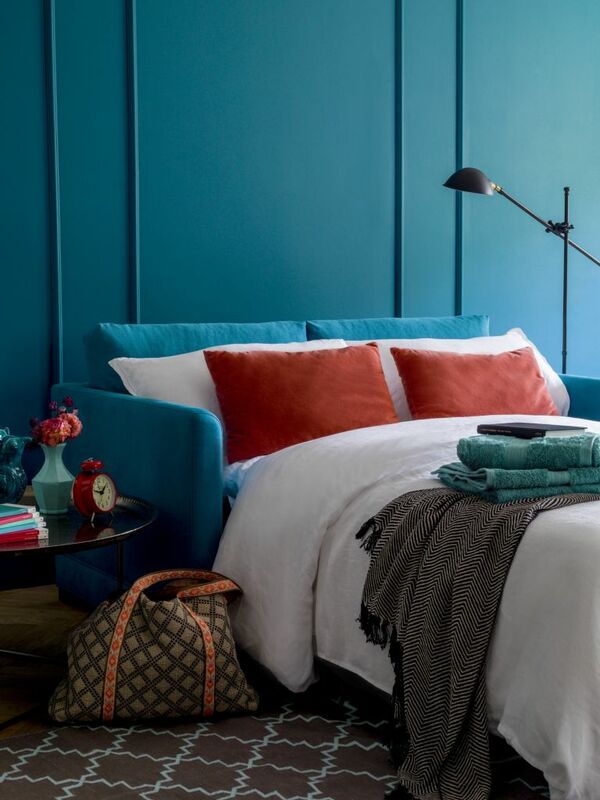 While not technically a sofa bed, a day bed is equally as versatile and with the right amount of strategically placed cushions can double up as a sofa. Plus day beds tend to be a lot more comfy than your average sofa bed, so if you have regularly have guests, it might be a better option. We love the traditional iron metal frame of this Ariela day bed from Wayfair. It comes with a trundle bed too, so you can pull it out into a double bed. Check out all of Wayfair's sofa beds and day beds. Go on find a home that this classic sofa bed wouldn't fit into.With its pleated arms and rounded edges, the Olivia Sofa Bed from Neptune, is perfect if you are after a sofa that's traditional and elegant, but still looks cozy and inviting (the combination of qualities we all strive for). The base cushions have a firm fam core that is surrounded by the soft pillowy goodness of father down, that why you get a nice soft sofa but can't feel the bed beneath. Looking for more sofa advice?